The goo.gl link shortening service will be shut down on March 30, 2019. 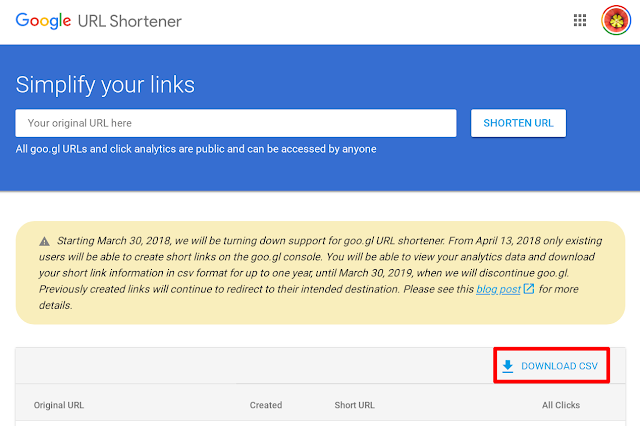 This is your last chance to download your short link information. Note that the short links will continue to redirect correctly, you just won't be able to create new goo.gl links or view data about your existing goo.gl links. Google's replacement is Firebase Dynamic Links (FDL), which are designed for app developers. Existing short goo.gl links short links will not be migrated to the Firebase console/API. The CSV data can be imported into Google Sheets or into any spreadsheet software. Read the original announcement on the Google Developers blog for more details.